A: The size is 18x13mm. Settings sizes are in the title. This is the size stone or cameo the setting accepts. So in this case 18x13mm. You are looking for 15x10mm which is not a standard size. 14x10mm is though. Are you sure you are not a millimeter off in your measurement? I do have a few 14x10mm settings you could look at. 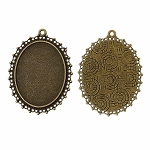 Q: Do you have this design in bronze or gold? 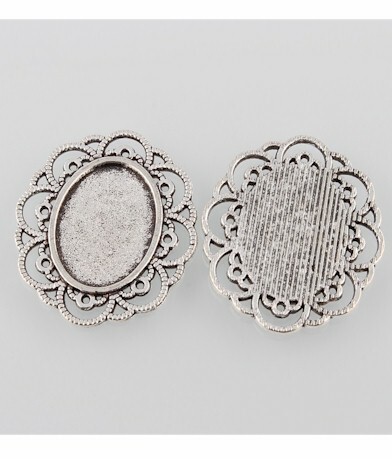 I am looking for a setting that has loops on the sides but is still ornate looking so that I can slip a ribbon through the back and adhere it to a invitation. I would really like this look instead of just setting the setting and cameo on top of the ribbon.